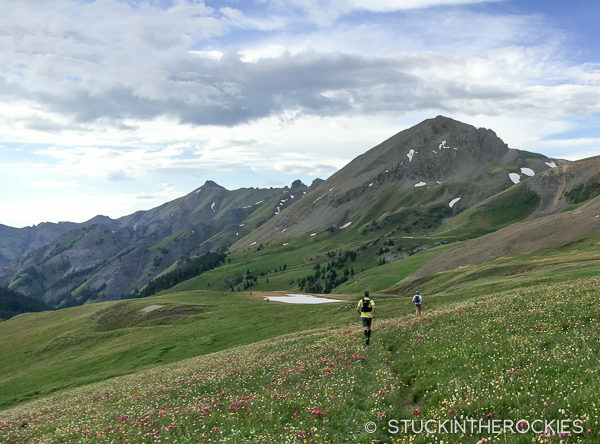 If there’s one thing I have figured out after nine finishes at the Hardrock 100, it’s that you should never go into it thinking you’ve actually got it figured out. Train all you want, manage as many details as you think you can, but be ready for some curveballs on race day, and don’t be surprised when they come. Approach the race as a perennial student of the course, rather than a master of some sort. It’s the surest way to not suffer mental setbacks when the unplanned occurs and your motivation risks getting sapped. Applying that lesson, this year’s race went well for me. I reached the finish in 29:22, which was my 4th fastest time. It wasn’t too long ago that a sub 30 hour time almost guaranteed you made the top-ten, but this race and the ultra scene is becoming increasingly competitive and this year it put me in 12th overall. All things considered (and I’ll get to some of those things in a moment) it was a great race. Most significant among those considerations was the fact that when the December lottery was held, I didn’t get in. I drew eighth on the veterans waitlist. The prior year the fifth person on that list didn’t run, so I wrote off this year’s race. 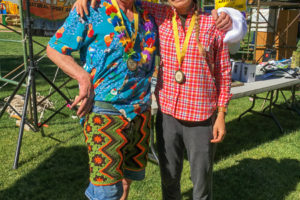 I went though the winter and spring with no plans to prepare as I usually have, and then sometime in early June the race director Dale Garland emailed and told me a space opened up and it was my turn. It was a total surprise, I hadn’t been watching the waitlist and I didn’t expect the call. 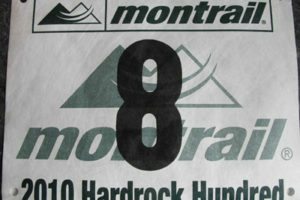 The race was about 6 weeks away. Christy and I had been running a lot through the early part of June, but not as much as I would have had I known I was in. 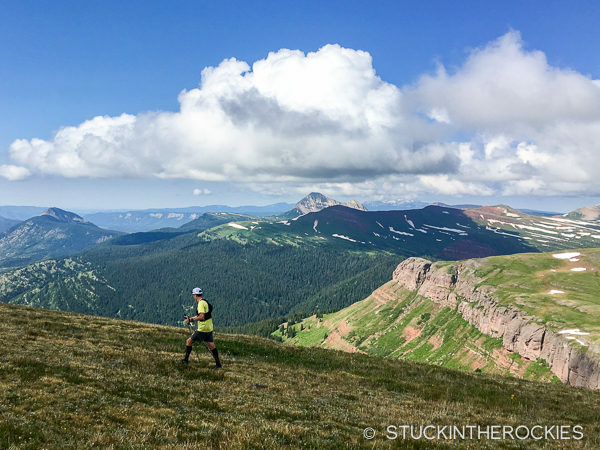 Many runners would have been nearing the end of their training and starting their taper as I was deciding whether or not to race. So there wasn’t a lot of time. But when someone offers the opportunity to participate at this event you say yes. Which is what I did. I would just have to hope that my prior experience here would be enough to make up for the light preparation. Credit always go to the crew members that assist in the effort, and no one has been there more than Christy. This year she paced me from Chapman Aid Station at mile 82 to the finish. I planned to take it easy from the start, and about 25 or so people ran off ahead of me. Once we were running I settled in to a comfortable pace, or maybe I should say a somewhat uncomfortable pace, but one that I thought I might be able to do all day. 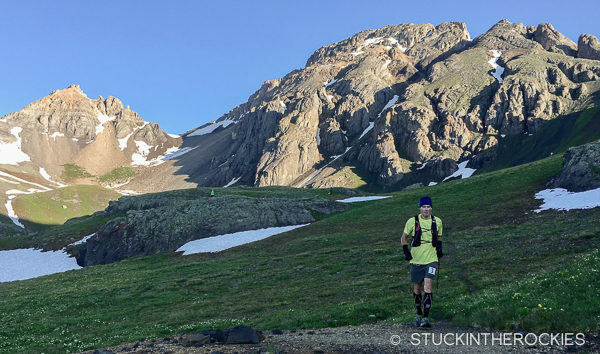 I cruised to Pole Creek (mile 21) smoothly, I was actually matching my PR pace from 2013. Not long after leaving Pole Creek the bad weather arrived. Punishing hail came down so heavily it actually stung a bit as it impacted. It buried the trail in what looked like snow. 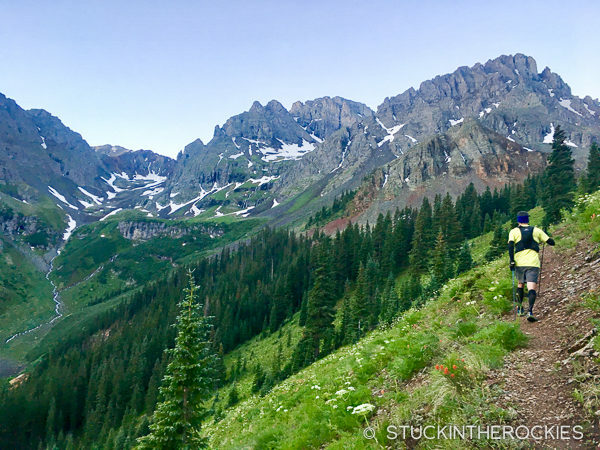 I made my way down the sloppy trail below treeline and to the aid station at Sherman (mile 28) before the lightning arrived. I huddled under a tent at the aid station for a few minutes and then departed in the pouring rain up towards Handies Peak. I just put my hood up, my head down, my earbuds in, and I didn’t think about it. Anyone who was in this section of the course at this time was soaked. About an hour after the deluge began it finally let up, which for me was right at the start of the climb up Handies. I dried out a bit on the hike to the 14er summit, but the threatening weather was still all around me. As I topped out on Handies Peak (14,048 feet) another wave of rain arrived. It made for some slow going on the descent through American Basin, and that combined with a lot of swollen creeks and snow on the ground meant I was getting wet from above and below. As I made it down to Grouse Gulch Aid Station at mile 40, the storm cleared a bit and I dried out again. But it took its toll, the bad weather just makes everything a little harder and slower, you exert more energy and focus, it’s just not conducive to being fast. 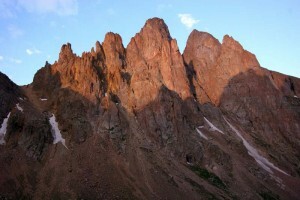 I met the crew at Grouse, changed my socks and began the long trip to Ouray with Tim Mutrie pacing me. Nearing the top of the Engineer Pass jeep road, about halfway through the course. Running down Bear Creek towards Ouray. From then on the weather was nicer, and it stayed that way through the night, but the ground was still quite wet and the creeks high. I changed into dry socks at most aid stations, but a big creek crossing was never too far away. 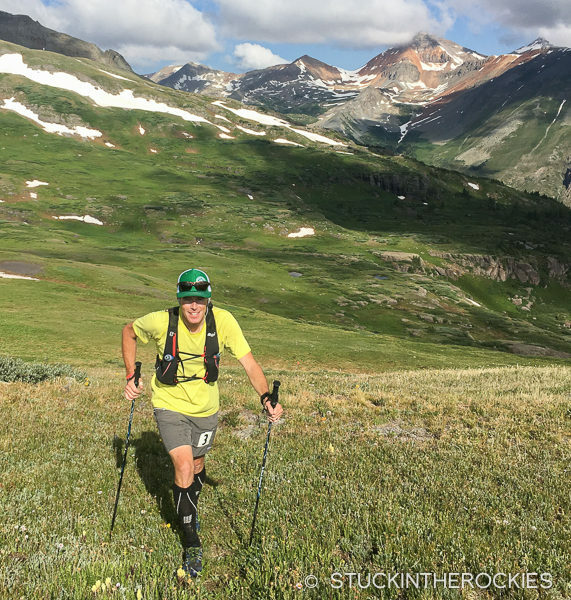 Once at Ouray (mile 56), Pete Gaston paced me through the night over the snowy Virginius Pass to Telluride, and then over Oscar’s, which was also had new snow accumulation, down to Chapman. It’s always a challenge to have a smooth night leg and so we tried our best to stay right at that manageable Goldilocks pace. Maintaining the appropriate pace at that point in the race is never an easy thing to do. You’re trying to go fast enough that you don’t lose time on the field, but you also can’t work so hard that you get crushed by the late night, low energy, all-I-want-to-do-is-sleep bug. 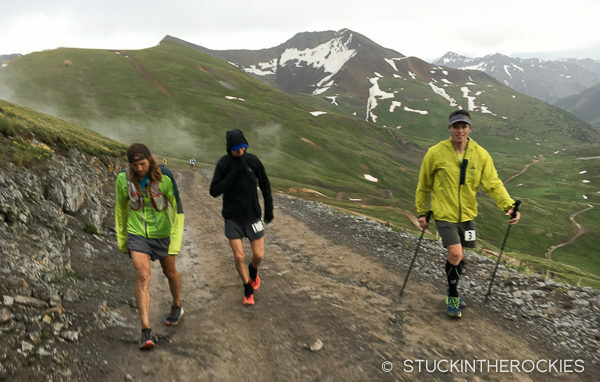 After 18 hours on the course and running through the heat of the day runners can be extremely fragile, and pushing it too hard at this point can result in a bonk, a bad stomach, or the impromptu “dirt-nap” on the side of the trail. If you can manage that period of time in the back half of the night well, you’ll have a good race because once the sun comes up everything seems to reset. Heading up from Chapman Gulch to Grant-Swamp Pass, the low point out in the distance. That said, we made it through the night smoothly. We did a great job of maintaining our place in the field, we even moved up a couple of spots. We pulled into Chapman at mile 82 as the sky lightened and Pete tagged out for Christy. She would take me in from there, pushing me (figuratively speaking) over the last few passes to the finish. Easier said than done of course, climbing up Grant-Swamp Pass in this direction is always a huge struggle, and then the leg from KT to the finish has some moments where runners can see people ahead or behind in the distance, and that’s when a real race might begin. You better save something in the tank for that section or you might get reeled in by some behind you. Descending from Grant-Swamp Pass and past Island Lake around mile 87. In the Putnam-Cataract section, one one of the final climbs of the race. Nearing the final descent, about 28 hours after we started. Christy kept me moving really well. There were a few runners ahead of us we thought we could catch, and at the top of the final climb we were alerted to our place on the bubble near 10th place. We ran through the last aid station in without stopping in pursuit of those ahead of us and the potential top-ten finish. 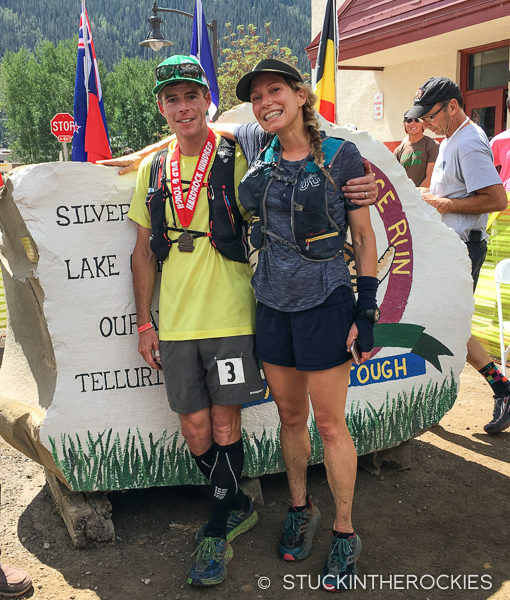 Darcy Piceu, who I was leapfrogging with for nearly the entire race was with us as well, and the three of us ran to the finish in 1:10, the fastest leg of the whole race and my fastest split on that section in five years of running it in this direction. I guess I had something left in the tank. Or else Christy was really good at motivating me. Having run most of the course near or with Darcy, as we neared town we both agreed we didn’t have a desire to get into a sprint to the finish, so we just ran to the rock together. It seemed like the sensible thing to do. 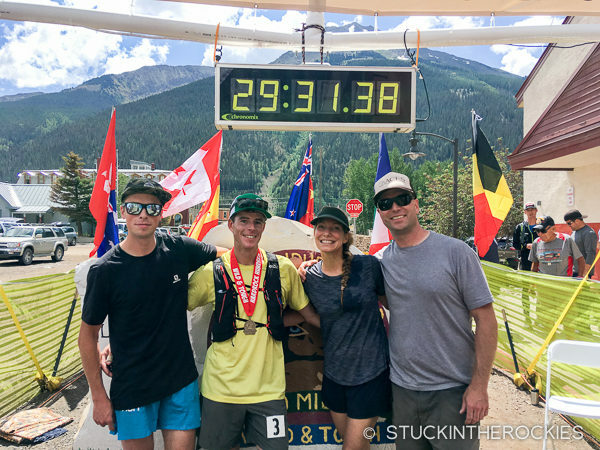 At the finish, along with the crew– Pete Gaston, Christy, and Tim Mutrie. Thanks for the support at another successful Hardrock! In spite of a light training schedule, a wet course, and a couple of hours of rain, and with the help of my awesome crew I managed to put together a really good race. It wasn’t my fastest by about an hour, but I can only look at it as a success. Yet the elusive perfect race still remains. 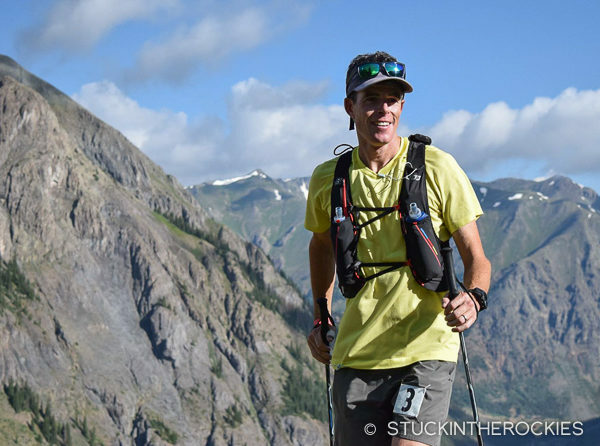 For a recent interview on the race with the Aspen Times, click here. Dang Ted,smiling in every photo,just strolling thru a 29 hour Hardrock,very impressive.At least try to fake looking tired at the finish line! Good to talk with you,hope you and Christy have a great rest of the year,Randy. Randy, you can’t forget I get to pick which photos make the blog, there were a few that looked as though things were so cheery. Thanks for the inspiration through the years. Now go get your qualifier and get back to the start line… unless you really meant what you said about enjoying the pacing. Ted, you are such an inspiration to us all! So proud of you! Such a Hardrock legend you are, Ted. Congratulations on another fine finish. What a team you have too! Thanks. Yes, they sure are a help.